Few things in life are better than eating an ice cream cone on a hot day. Here’s where to get the best ones. This entry was posted in Best of and tagged The 31 Best Ice Cream Shops in America on May 15, 2018 by George Dunlap. This entry was posted in Best of and tagged THE BEST ICE CREAM PARLOURS, USA TODAY on August 22, 2017 by George Dunlap. Corn and blackberry ice cream at Seven Lions Chicago. Corn! Boy, you can taste it in this Loop restaurant’s sweet-corn and blackberry swirl ice cream. No wonder. Sixteen corn cobs are used to make each batch, says Rebecca Zuckerman, executive pastry chef. $7. 130 S. Michigan Ave., 312-880-0130. Cassis sorbet at The Publican. Black currants can be so sour they “make your eyes pop out,” says Dana Cree, executive pastry chef for The Publican. But her sorbet, enlivened with verjuice (an extra-tart grape juice), has just the right tang. A scoop comes garnished with a waffle cone wedge. $6. 837 W. Fulton Market, 312-733-9555. Raspberry sherbet at Monteverde. Chef and co-owner Sarah Grueneberg serves the seasonal sherbet two ways — get it with two blueberry-chocolate cookies ($5) or as part of a more complex dessert created by pastry chef Sara Lamb. For $12, a rich chocolate tart topped with a round of toasted meringue comes with a scoop of the smooth, rose-pink sherbet over a mound of crushed raspberries. 1020 W. Madison St., 312-888-3041. Blueberry gelato Housemade blueberry jam is mixed into the gelato at Nico Osteria. (Bill Daley / Chicago Tribune)Blueberry-crostata gelato at Nico Osteria. Imagine blueberry cobbler as a gelato, and that’s what you get at this Gold Coast restaurant. Pastry chef Leigh Omilinsky makes a cream-cheese gelato and folds in pecans, bits of pastry crust and housemade blueberry jam. The finished product is more tart than sweet, just the way she wants it. $3 a scoop. 1015 N. Rush St., 312-994-7100. Corn ice cream at Acadia. The ice cream “truck” dessert on the bar menu at this South Loop restaurant comes with three oval scoops of ice cream (corn, lobster and fennel) and a scoop of lime sorbet. All flavors are almost head-spinningly true to form; for the corn, that means the flavor of biting into an ear of sweet corn teamed with the creamy texture and chilly temperature of ice cream. $10. 1639 S. Wabash Ave., 312-360-9500. This entry was posted in Best of and tagged acadia, chicago trubune, corn ice cream, nico osteria on August 24, 2016 by George Dunlap. By George Dunlap: Check out this story of a great C.Nelson friend and customer Mitchell’s in San Fransisco.. I had the privilege to meet with Linda after she purchased her recent C. Nelson ice cream cabinet. If you are ever in her neighborhood stop and say hello and enjoy some great tasting homemade ice cream. This entry was posted in Best of and tagged best of san francisco, mitchell's san francisco on August 24, 2016 by George Dunlap. 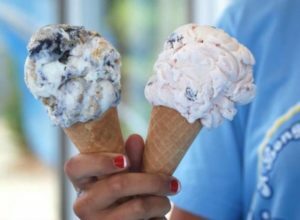 These ice cream shops are all more than worth the trip.For a country treat: Chester Springs Creamery at Milky Way Farm The coolest thing about this working Chester Springs farm and dairy is that every single cow has a name, and every single ice cream in the creamery is attributed to one of them. So when you pop into the big, bright ice-cream shop on the top of the hill, you’ll be scoring a cone of Melody’s mocha chip or Bessie’s black raspberry. Don’t limit your visits to summer: Come fall, you can score Abby’s apple cinnamon ice cream.521 East Uwchlan Avenue, Chester Springs. For small-town charm: The Wayne Coffee & Ice Cream Bar You’d think a subterranean ice-cream shop would feel gloomy. But this spot nestled in the basement of the Suburban Building is cheery, airy, and just retro enough, with Hamilton Beach milkshake machines and expanses of shiny white marble. Head here or to its newer sister shop, West Chester Coffee & Ice Cream Bar, for goods from local and small-batch vendors: ice cream from Philly’s Little Baby’s, Chester Springs’s Scooped and Ohio cult-favorite Graeter’s, plus daily-baked doughnuts and fresh coffee.134 North Wayne Avenue, Wayne, and 6 East Gay Street, West Chester. 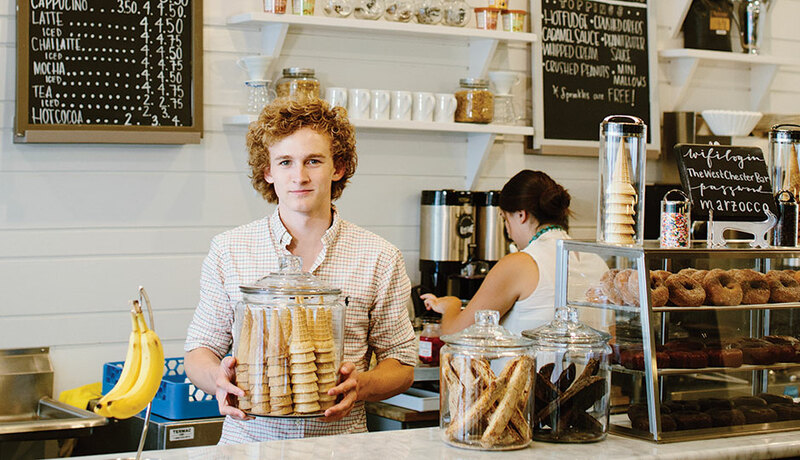 For waffles with your ice cream: Nina’s Waffles This four-year-old ice cream shop nestled on a quiet corner at the top of a steep hill in New Hope is cozy and quaint, with iron chairs, wooden tables and authentic roots. (Owner Louis Zanias is from Belgium, so the waffles are the real deal.) But don’t mistake it for a tiny operation: This is one of a quartet of locations (the latest opened in Princeton in April; the New Hope flagship at 31 West Mechanic Street is still our favorite), plus a trio of food trucks. But what they serve up would be just as good if it came from a rickety stand on some Brussels side street: a scoop of homemade salted caramel ice cream atop a fresh-from-the-iron Liège waffle.Multiple locations. This entry was posted in Best of and tagged bassetts ice cream, Chester Springs Creamery, Graeters, nina's waffles, wayne coffee & ice cream bar on August 1, 2016 by George Dunlap. Chicago right now11 best artisanal ice cream flavors in Chicago right now11 best artisanal ice cream flavors in Chicago right now (Lenny Gilmore / RedEye)Morgan OlsenMorgan OlsenContact ReporterI scream, you scream, we all scream for something that will cool us off on an insufferably hot summer day. And while the freezer aisle has plenty of classics to choose from (hello, Choco Taco, old friend), we’re thinking bigger. 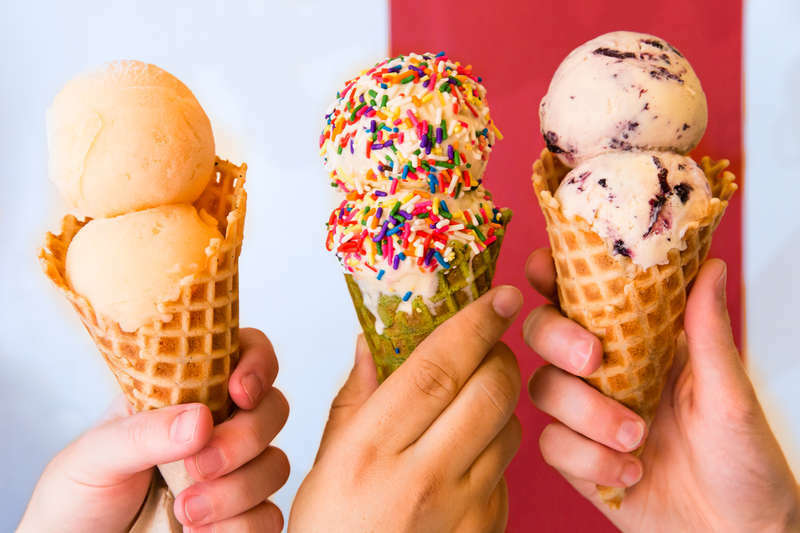 It’s time to upgrade your ice cream game and check out some of Chicago’s tastiest artisanal scoops. We sampled offerings from across the city and picked the best chef-crafted pints you can pick up at a restaurant or retailer near you. 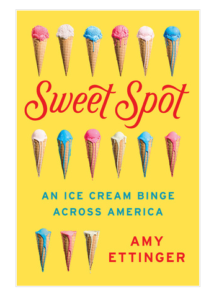 From a light, bright grapefruit-prosecco sorbet to a sinfully decadent chocolate-marshmallow treat, there’s something for every ice cream connoisseur. 1. Dulce cayenne ($10 per pint or three for $25) from Siena Tavern51 W. Kinzie St. 312-595-1322Decadent dulce de leche-infused ice cream is generously studded with caramelized nibs and sprinkled with a hint of ground cayenne pepper. In other words, you won’t want to share. 2. Caramelized banana chocolate chip ($5.50 per half-pint or $2.95 per quarter-pint) from Americano 22112211 W. North Ave. 773-360-8757This frozen delight captures the essence of fresh-baked chocolate chip banana bread perfectly. Just like Mom made it. Pro tip: Grab a few TCHO chocolate chip cookies ($1.75 each) while you’re there and make your own ice cream sandwiches at home. 3. Cherry cobbler gelato ($9 per pint) from Nico OsteriaFind it at Publican Quality Meats, 825 W. Fulton Market 312-445-8977Say hello to summer in a pint. Cream cheese-vanilla gelato is pumped full of tart cherry jam and crumbly cobbler pieces. 4. Chicago coffee ($8.50 per pint) from Ruth & Phils Gourmet Ice Cream 636 W. Chicago Ave. 872-802-4868Beans from local favorite Dark Matter Coffee are ground, steeped overnight in cream and sugar and then jammed into this intense java-flavored concoction. Because eating your coffee is way more fun than drinking it. 5. Lemon olive oil ($10 per pint or three for $25) from Siena Tavern 51 W. Kinzie St. 312-595-1322Bits of bright lemon zest, swirls of creamy olive oil and a hint of sea salt mingle in perfect harmony, creating a scoop that could cool you down on the hottest summer day. 6. Pineapple basil sorbet ($8.75-$10.75) from Black Dog Gelato 859 N. Damen Ave. 773-235-3116 Basil is boss in this soft, pineapple-perfumed treat that’s both refreshing and insanely addictive. You don’t need a bowl or a cone—you’ll want to eat this one straight from the pint. 7. Spumoni ($5.99 per pint) from Homer’s Find it at Olivia’s Market, 2014 W. Wabansia Ave. 773-227-4220We cheated with this suburban staple, but with retailers in the city, there’s no drive required to get your hands on this three-in-one dessert with cherry, pistachio and chocolate ice creams layered in one perfect pint. 8. Pistachio ($10 per pint) from Bar Siena 832 W. Randolph St. 312-492-7775Huge chunks of pistachio swim in a pristine pool of nutty goodness. 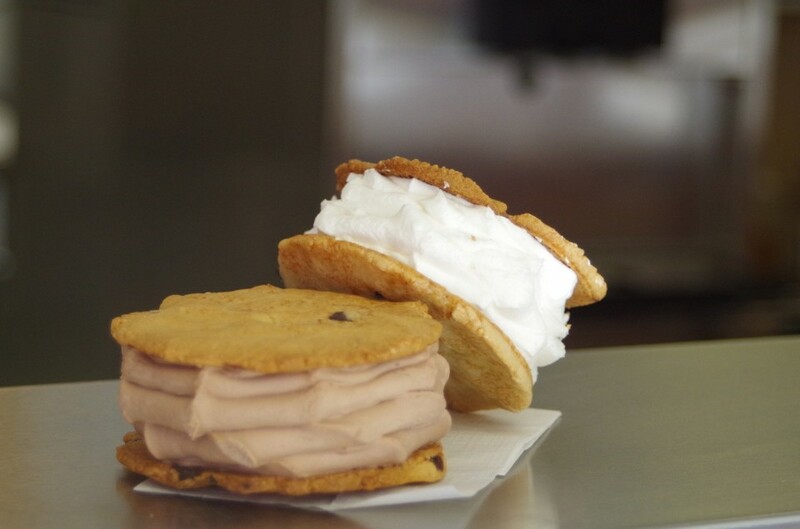 Pick up a pint at the West Loop restaurant or hit Bombo Bar, their grab-and-go dessert window, where you’ll inevitably be tempted to get your scoop served between two cookies ($6) if you can’t commit to a pint. 9. Strawberry shortcake ($10 per pint) from David Burke’s Primehouse 616 N. Rush St. 312-660-6000The seasonal pop-up ice cream shop is back in full effect, and this week’s flavor (available Friday from 4-6 p.m.) remixes a classic summer dessert. Perfectly pink strawberry ice cream is served with shortcake pieces, lemon gelee and strawberry sauce as optional toppings. 10. Grapefruit prosecco sorbet ($5.50 per half-pint or $2.95 per quarter-pint) from Americano 22112211 W. North Ave. 773-360-8757You know that feeling you get when you walk into an air-conditioned place on a 100-degree day? This guilt-free sorbet is a lot like that. An explosion of citrus meets you up front and fades into a delicate, summery taste that lingers long after you scrape the bottom of the container. 11. Raspberry peach ($10 per pint) from Bar Siena 832 W. Randolph St. 312-492-7775Just like your favorite summer pie served a la mode, this ice cream is loaded with hunks of juicy raspberries and tart peaches. Pick up a pint at the West Loop restaurant or hit BomboBar, their grab-and-go dessert window. This entry was posted in Best of, News and tagged 11 best artisanl ice cream flavors, artisanal, chicago, redeyechicago on June 28, 2016 by George Dunlap.